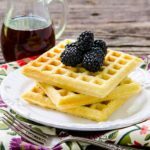 Cornmeal Buttermilk Waffles are a southern twist to regular waffles. They have the classic texture and flavor of cornbread to enjoy for breakfast. Whisk together cornmeal, flour, sugar, baking powder, baking soda, and salt in a large bowl. Whisk together buttermilk, egg yolks, and oil in a small bowl. Add to cornmeal mixture and stir until combined. Beat egg whites until stiff peaks form. Gently fold egg whites into waffle batter. Lightly spray heated waffle iron with non-stick cooking spray. Ladle and spread 1/2 batter onto waffle iron and bake according to the manufacturer's instructions. Repeat with remaining batter.